If there ever was a national park that lived up to its name, it’s Death Valley. As the driest, hottest and lowest point in North America, sustaining life within its boundaries can be difficult. On the surface this may not seem like a recipe for an enjoyable excursion, but in reality, it is a place of many natural wonders. 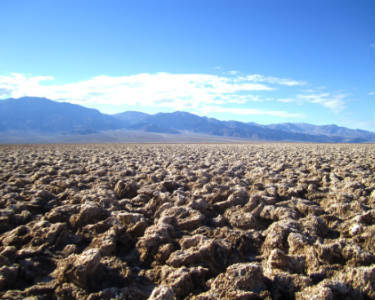 In fact, Death Valley National Park draws nearly a million visitors a year. the lowest dry point in North America. Death Valley National Park is 120 miles from Las Vegas — a drive of approximately two hours — and can be accessed through various easy or scenic routes. The shortest route is to take NV Hwy 160 West through Pahrump, turn left on Bell Vista road, continue to Death Valley Junction, then follow the signs until you reach Furnace Creek Visitor Center on CA Hwy 190. Because of its relatively close proximity to Las Vegas, the park is popular for day trips. Due to the vast expanse of the park, however, overnight stays provide much more opportunity to take in all that Death Valley has to offer. 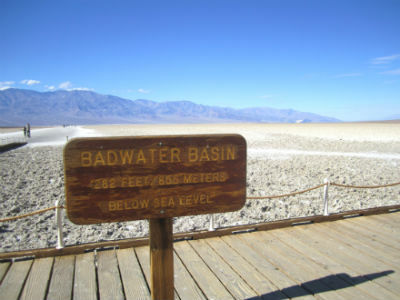 The famed “low point” of the park is located within Badwater Basin. At 282 feet below sea level, guests can view a surreal landscape of vast salt flats. There are patches of water throughout; however, it is all tainted by the salt (hence the term “Badwater”). Walking on the uneven flats can be difficult and even dangerous, thus the park built a walkway to help visitors along. From the basin one can see the beautiful Telescope Peak, the highest point in the park, in the distance. Just west of the basin, Dante’s View provides arguably the best photo opportunity in the entire park. From this mountaintop overlook, guests can get incredible panoramic views of the Panamint Range and Devils Golf Course. At night, this is a popular spot for stargazing. The park is home to 14 trails and hikes, including Desolation Canyon, which weaves through colorful badland narrows, and Wildrose Peak Trail, which begins near 10 charcoal kilns that have been standing since 1876. All hikers, from the novice to the experienced, should remember to bring plenty of water and be prepared for the heat. Those who prefer not to traverse the trails in the desert sun can opt to take their vehicles on Artist’s Drive, a 9-mile paved road that loops through multi-hued volcanic and sedimentary hills. 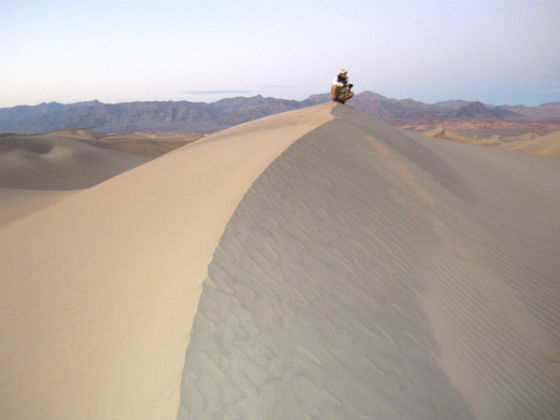 In the Stovepipe Wells area of the park, visitors can experience a completely different environment at the Mesquite Flat Sand Dunes. Here, guests can see the desert rock landscape change into impressive and beautiful sand dunes. For those willing to trek a rough two-hour drive to the north, one can find the even more impressive Eureka Dunes. This area is home to endangered species of plants and animals as well as dunes towering nearly 700 feet. The northern portion of the park is called the Scotty’s Castle Area and was named after a Spanish-style mansion built by a prospector in the 1920s. Scotty’s Castle is still standing and available for tours. Perhaps the most mysterious place in Death Valley is the Racetrack Playa, which is also located in the Scotty’s Castle Area. 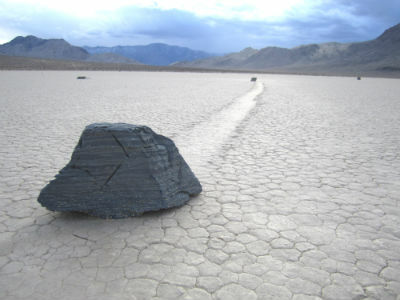 This 2.7-square-mile dry lake is home to the famous “sailing stones.” These rocks slowly move across the Racetrack lake bed and leave behind long tracks. Despite it’s name, Death Valley is actually a place where many unique plants and animals thrive. With such heat and little rainfall, wildlife has learned to survive. The Devils Hole pupfish is an endangered species that has been isolated in the waters of Devils Hole for more than 10,000 years. Most land animals, which include bighorn sheep, coyotes, rabbits and roadrunners, are nocturnal and only come out at night. Visitors should be aware that rattlesnakes can also be found in the park. Since extreme weather conditions are not unusual, guests should always plan ahead before their visit. Temperatures regularly hit 120 degrees Fahrenheit during the summer months. Because of this, the most popular months to visit are January - April. Springtime is especially popular as blooming wildflowers attract many nature lovers. However, the park is open all year round, and braver guests can expect to beat the crowd in summer and autumn. Remember, there’s always lodging (and air conditioning) available at four locations. The most popular of these is the privately-owned, historic Furnace Creek Inn, which has been providing luxury accommodations since 1927. For those who wish to truly immerse themselves in nature, there are nine campgrounds available ranging from $0 - $18 a night. Food is available at nine restaurants scattered throughout the park.